Find a great sale price on the 2016 Toyota Highlander AWD 4dr V6 XLE at Bell Road Toyota. The 2016 Toyota Highlander is located at our Toyota dealership in Phoenix. So if you're looking for a great price on the 2016 Toyota Highlander AWD 4dr V6 XLE or just looking to get an auto loan for the vehicle you want... you've come to the right place! Bell Road Toyota. Come see this certified 2016 Toyota Highlander . Its Automatic transmission and Regular Unleaded V-6 3.5 L/211 engine will keep you going. This Toyota Highlander comes equipped with these options: Window Grid Diversity Antenna, Wheels: 18" Split 5-Spoke Machined-Face Alloy -inc: gunmetal grey finish and black center caps, Wheels w/Gray Accents, Variable Intermittent Wipers w/Heated Wiper Park, Valet Function, Trunk/Hatch Auto-Latch, Trip Computer, Transmission: Electronic 6-Speed Automatic w/OD -inc: ECT-i, sequential shift mode and snow mode, Transmission w/Oil Cooler, and Towing Equipment -inc: Harness. 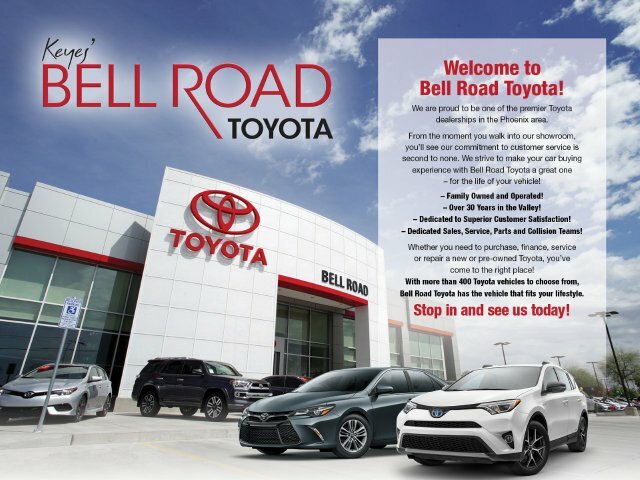 See it for yourself at Bell Road Toyota, 2020 West Bell Road, Phoenix, AZ 85023.